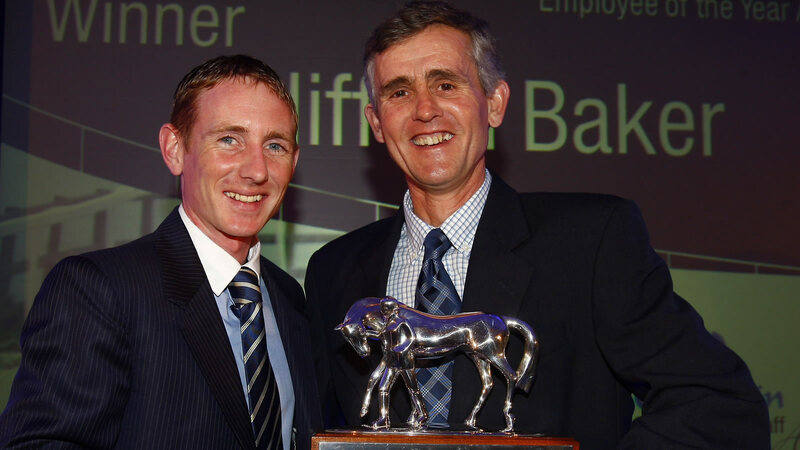 Clifford Baker crowned Employee of the Year at Godolphin Stud and Stable Staff Awards 2012. Clifford Baker was named ‘Employee of the Year’ at the eighth annual Godolphin Stud and Stable Staff Awards Ceremony, which took place at the Jumeirah Carlton Tower Hotel in London’s Knightsbridge. The Head Lad, employed by Paul Nicholls, was presented with the perpetual Godolphin Trophy by Guest Presenter Paul Hanagan. In addition to the stunning trophy, Clifford was also presented with a cheque for £25,000, of which £10,000 will be shared amongst the staff at Nicholls’ Yard. Each individual category winner collected £5,000, with their colleagues at their respective Stable or Stud also sharing £5,000 between them. The two runners-up in each category also received £2,000, with their Yard or Stud also collecting the same amount. The winner of the separate NASS Special Merit Award, judged by the NASS Executive, received an individual prize of £5,000.